The Innomax Water Bed Pedestal goes by several names: Pedestal riser, shadow box, waterbed pine pedestal rise. The most important thing to know is that it can be sold separately without buying the rest of a waterbed or comes as the basic standard box pedestal when you purchase any complete hardside waterbed (when bought new). The standard pedestal is the most economical bed riser that is available for a hardside waterbed. 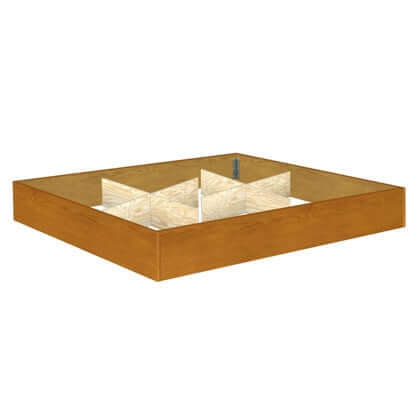 This 9-inch tall box pedestal is the most basic and simple of all waterbed pedestals. It is also the most common height for a water bed pedestal riser. Other heights such as the 12 inch, 13 inch, and 18 inch tall risers are sometimes obtainable or can be made. Box pedestal riser construction is often criticized for being built using thin 1/2 oriental strand board or plywood for middle bracing and, at first glance, some might agree. Talk to any industry expert and they will tell you that this is an ingenious idea and dramatically helps to cut the end cost to the consumer. By simply turning those boards onto their edges, their strength is increased many times over and you could park a truck on them when positioned correctly. This newly found strength can easily hold any size waterbed including those weighing more than 2000 pounds. The perimeter supports are made from 3/4 inch thick pine. While not as common, some competing models are made of cheap paper laminated veneers and other woods. Again, while many of these are quite strong, ours are even stronger since they are built from solid pine that is thicker and more resistant to water if they were to get wet. 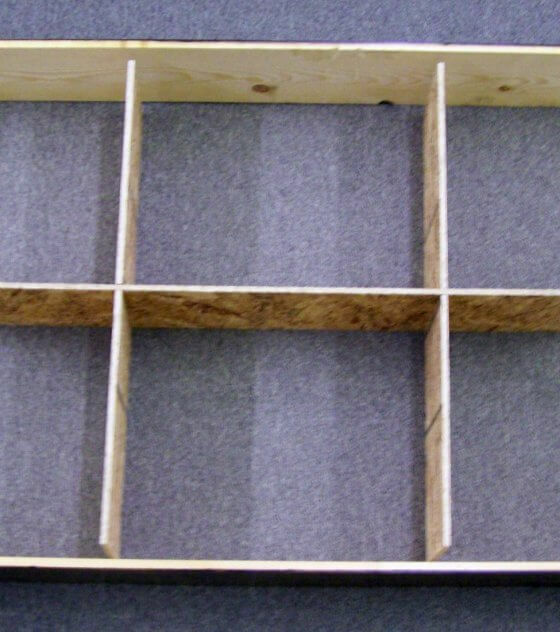 The finished sides and end boards are usually connected with corner brackets that screw into the wood or aluminum or plastic corner extrusions to complete the finished corner assembly. Ours use heavy duty metal corner brackets just like a waterbed frame and are screwed together. The center support for a box pedestal is made up of interlocking X or H pattern supports that typically use pine, particleboard or plywood. This is done to help keep costs low for customers without compromising strength. Call us for current exact specifications. The proper assembly of a waterbed box pedestal is critical and must not be disregarded. If you do not assemble a waterbed box pedestal properly, it is possible for it to collapse and fall causing damage to the bed, house, or even worse, yourself. A useful tip to note is that all stained, brown, or black exterior boards must be vertical. The waterbed corner brackets or extrusions must be at vertical as well and fully engaged or screwed into place. Over time plastic extrusions can get brittle and crack with age which is why we do not use them. Aluminum extrusions should not be loose or they could easily disengage from the side and end uprights (The finished boards). The center X or H supports should then be centered in the middle of the assembled finished side and end boards. When positioning the waterbed sandbox frame on top of a box pedestal, correct positioning is very crucial. The sandbox cavity (the part that holds the water) must be centered so there is equal overhang on each side so the weight of the water can be evenly distributed. Be sure if you are sliding the waterbed frame (sandbox) around on the box pedestal that you are careful not to pull the waterbed box riser apart at the corner extrusions. You should double-check the corners for tight assembly. The various Drawer Pedestals are optional and at extra cost. Click here to see our Drawer Pedestal Options.